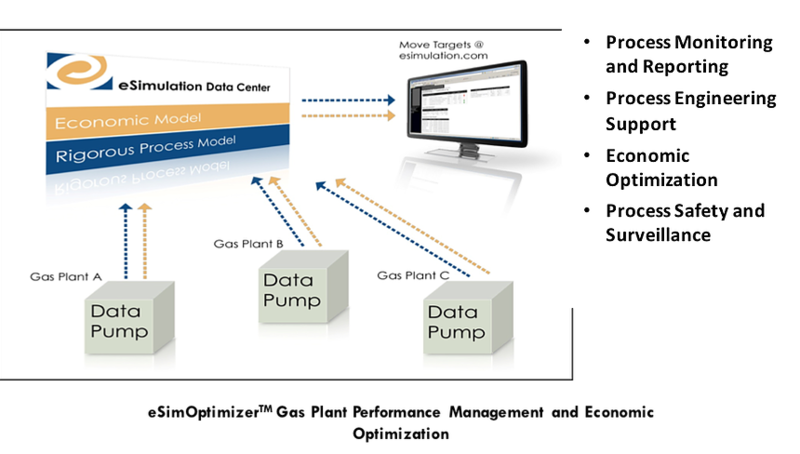 The eSimOptimizer solution captures plant data (temperature, pressure, flows, and analyzer signals) and transfers the plant data over the internet to eSimulation’s data center. The data is first reconciled in a rigorous optimization model – built to match plant operations – to calibrate the model to current plant conditions. A second run optimizes the plant by suggesting setpoint targets to the operator based on the calibrated plant model, current plant data, and current plant economics. The setpoint guidance is updated on a secure web page for operator entry. The plant settles and the operator receives a new set of targets. In this way, the operator is guided to take small moves to a continuously moving optimum. 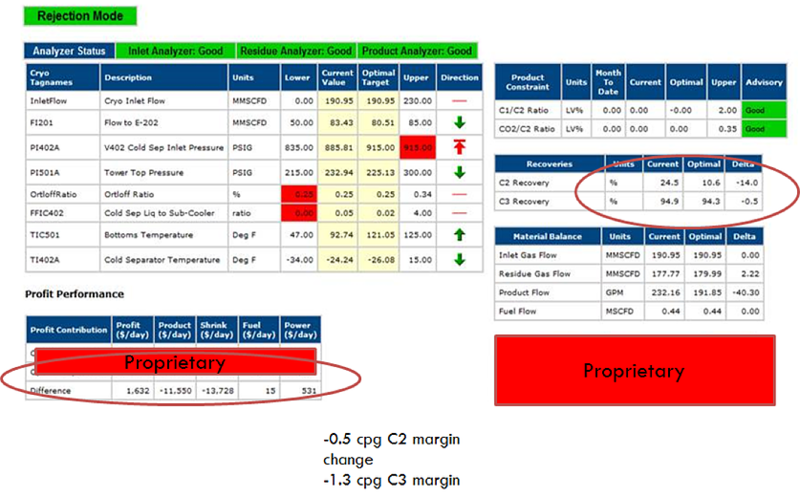 Setting optimal product recovery targets (primarily ethane and propane) to maximize product revenues while minimizing energy usage – Optimizing this key tradeoff – with the resulting efficiency improvements – drives strategic value for clients in all product margin environments. Optimally allocating the primary feeds to each cryo train, optimally loading multi-train facilities, and coordinating cryo / fractionation facilities – The model is comprehensive and captures facility-wide profit opportunities. Implementing the Value Capture Process (Sustaining Benefits) – eSimulation develops an optimization report every two weeks which describes how the optimization system is performing, describes the optimization moves in detail, and identifies any issues which should be discussed. The client then hosts a 15-minute conference call the following day to review the report and provide feedback on plant operating conditions that will affect constraints in the optimizer. Managing tradeoffs that change as the industry expands –The eSimOptimizer solution allows processors to address changes (pricing, inlet composition, takeaway, etc.) and capture value others miss. The model is equally suited for ethane recovery or ethane rejection, or propane rejection operation.